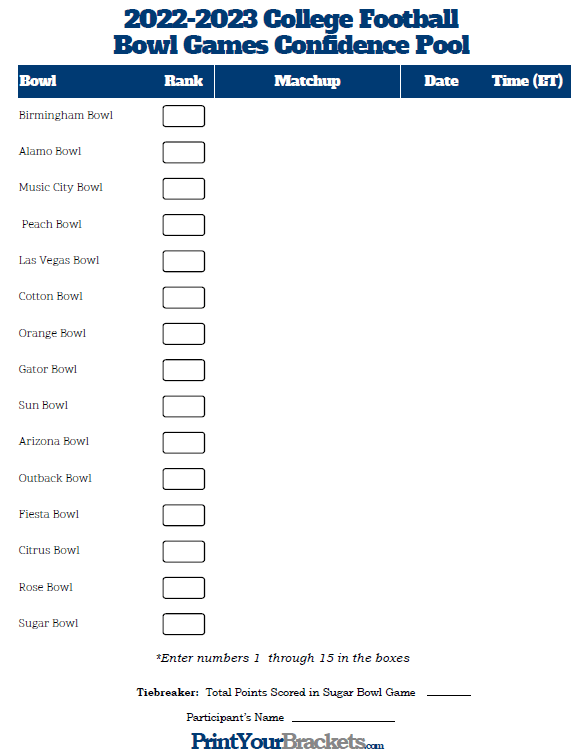 The Bowl Games Confidence Pool is a variation to our Bowl Games Pick'em Sheet. We have chosen 16 of the top bowl games for this pool. The participants of the pool are to pick the winning team for each game, and also in the boxes provided should write the numbers 1 through 16. The highest rank will be the team you are most confident will win their game. The printable version is below, along with full instructions on running this pool. 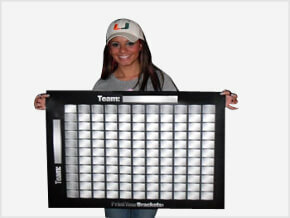 Also check out our College Football Playoff Bracket and our College Football Playoff Squares. Print the Schedule from above. Pass out a copy of the current week's schedule to family, friends, and co-workers. Each participant should circle the team they think will win each game, and also write down a number from 1 to 16 in the box beside each game. The numbers the participants are writing down represent how confident they are in their pick. The team they are most confident will win, should get the highest number, the game they are least confident in should get a 1. They should also write down what they think will be the total number of points scored in the Tie-Breaker game. This will be used as a tie breaker if two or more participants end up with the same total. After all of the games are complete, add the points(points = rank) of only the games that were picked correctly. The person with the highest point total wins.